A flavoured gin's the thing. It's good marketing - grow your range of products and you expand your brand. How many different bottles of gin do you have on your gin wall? We went to one house and there were 12 different bottles on the central kitchen island. That's a lot of dead stock. On the other end of the scale, Gin and Juice in Cheltenham has 350 different gins and growing. Take a look at the prices and the flavoured ones are substantially more expensive than normal gin. Like the difference in price between fresh salmon and smoked salmon which is 2 - 3 times as much. That kind of makes you want to make your own flavoured gins in itself. Last year I was experimenting with different flavours. Economics aside, the main reason you'll want to investigate flavoured gins is for all the amazing variations you can serve up to your friends that they'll never be able to buy in a shop. Thirty years ago my great aunt was experimenting with a lemon and orange vodka liqueur - vodka, caster sugar, orange zest & lemon zest. You put them in a bottle and shook it up once a day for a month. One month later it was ready to go and was like a variation on cointreau. You could use a cheap vodka because you get the flavour from the citrus. So I took the same idea - alcohol, sugar, fruit and here you can see the results. I also found that you need to put these in the fridge while they are maturing. You might think the alcohol will preserve the fruit, which it does, but left out of the fridge it can start fermenting and go sour. It's almost sacrilege to add things to Cotswolds Gin - it tastes so good in itself, but I had some left over from a tasting menu event. There were also raspberries and blueberries left from their dessert so I brought those 3 things together. Put your ingredients ideally in a kilner jar or other vessel that isn't plastic. I found storing this in a plastic container as I did with the pomegranate gin, below, the plastic can taint the contents. Taking the idea from my pomegranate rum, I tried a gin version. A lovely sweet-sharp taste. You crunch the seeds as you drink to release their flavour. Makes me think a cranberry gin could be really good for Christmas time, though it would need more sugar for the sharpness of the cranberries. 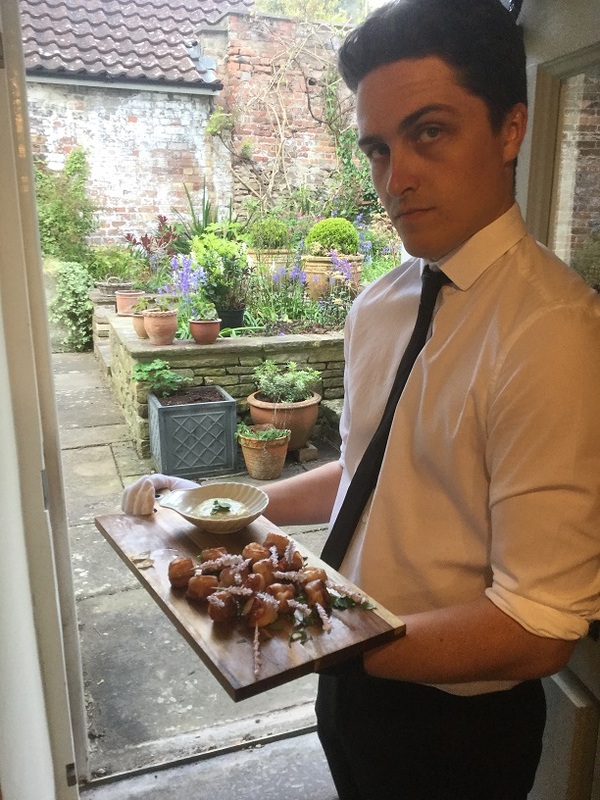 Steady on ladies, it's a throwback to a birthday dinner party in Berkely 2017 and Henry serving canapes for a 50th birthday in Berkeley. Like a musician remembered for one song, we'll probably only remember Ceaser Cardini for the salad which maybe he didn't even invent - but then everyone always wants to take the glory don't they. It always amazes me when you look in the salad dressings aisle of supermarkets just how expensive dressings are for what they are - there's a money making business if ever there is one. Me? I just keep a few staple ingredients in the fridge and store cupboard and you can make anything - quite how the Ceaser salad came into being in the first place. Ceaser salad is great comfort food. The day after I catered for my grandpas wake I left my brother with all the ingredients to make Cesaser salad for everyone while I went back to work. It's both comfort food and easy to eat and therein lies it's popularity. The umami from the parmesan helps too. Ceaser dressing works very well as a dip for chips or potato wedges? Try it! Like marmite people either love them or hate them, and as a chef you end up just always serving the anchovies on the side so guests can choose whether they want them or not. I am a great anchovy fan and prefer using the fresh marinated anchovies rather than the tinned variety. You can add anchovy paste to the dressing as well. Another thing people get wrong so often with Ceaser salad is not drying the lettuce enough after washing. Excess water clinging to the leaves just dilutes the dressing and you see a puddle of thin dressing swimming around in the bottom of your salad bowl rather than clinging to the leaves - what's the point in life? Spin the salad leaves in a salad spinner, then dry on a clean tea towel as well for good measure. Why cheats? Because you're not making it from scratch with egg yolk and oil. But that's all mayonnaise is really. Using sherry vinegar rather than wine gives it a really nice extra flavour. Don't get carried away with the garlic as the flavour develops after the dressing is made. This has the simplest method - you just combine everything in a mixing bowl and whisk together. If your mayonnaise is quite salty already you probably don't need extra salt (think of your arteries). Depending on how thick your dressing is you might need to add a little water to loosen it so it is coating consistency for the lettuce leaves. How long will Ceaser dressing keep in the fridge? If you are making your own mayonnaise base from raw egg it will only last 3 days in the fridge. But if you use a brought mayonnaise made from pasteurised egg it will last up to a month in the fridge - an instant snack for you. 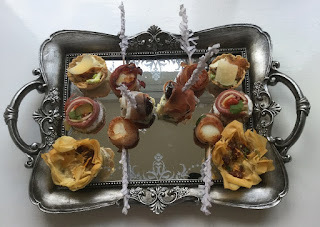 You can also make these starter size or bowl size for a lunch or even bigger to share at the table - endless possibilities. To make the canape size ones you need a mini muffin tin. Cut out tortilla circles with a cutter larger so the circles will fill the base and all the way up the sides. Place the cut out tortilla circles into a tray/ bowl of cold water and let them soak for 10 seconds. Then take them out and mould them into the mini muffin tin. Bake in a preheated oven at 160 oC for 7 - 10 minutes till crisp. You want them just golden. First make the parma ham crisps. Lay pieces of parma ham on a baking sheet with baking mat or greaseproof paper. Bake in a preheated oven at 180 oC for 5 - 6 minutes till crispy. Put a timer on - they are easy to burn (done so many times). Also make more than you need because they are so edible straight out of the oven. Cut baby gem into small cubes - small enough to fit into the mini tortilla baskets. Mix with the dressing. The crispy tortilla baskets don't stay crisp forever once they're filled, so leave it as late as you can till you make them up before serving. Spoon the lettuce mix into the tortilla baskets. 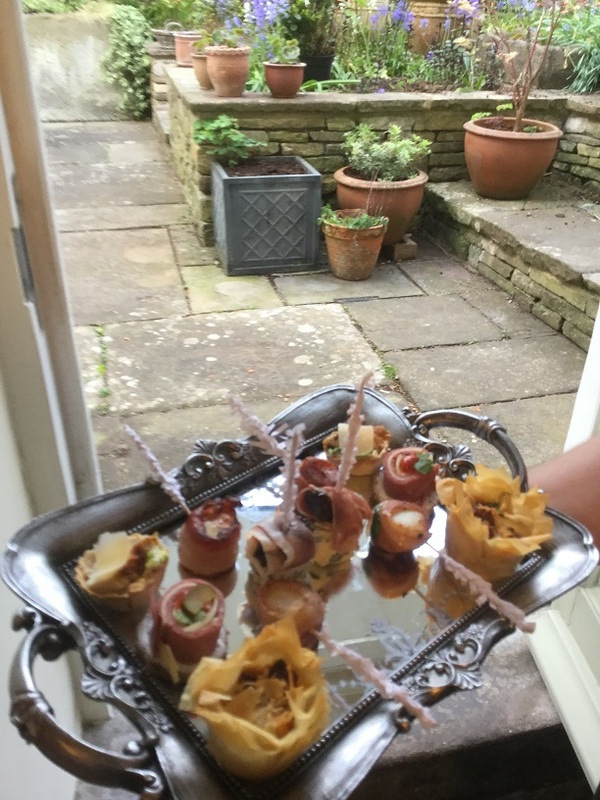 Garnish with parmesan flake, broken parma ham crisp and slice of anchovy. You could also add a small slice of grilled chicken. My entry for World Trifle Day 2018. Trifle. What's not to like? Apart from mass produced shop brought ones of course. 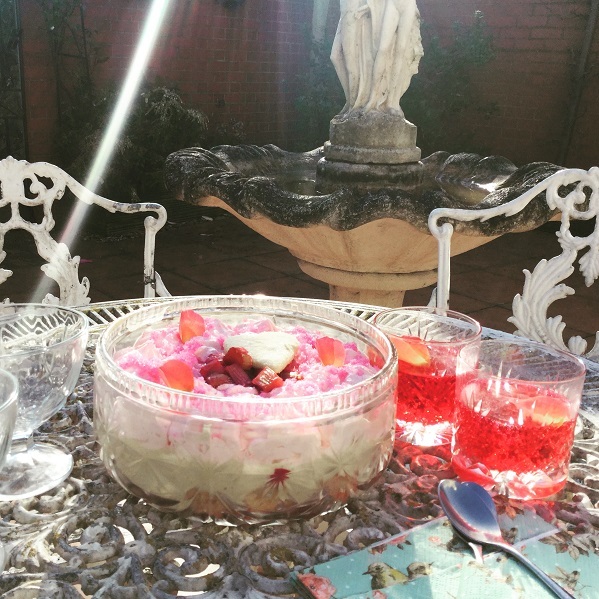 Trifle deserves more - it can be elevated above a kids table staple. Do yourselves a favour and make your own sponge base, your own vanilla custard and then it turns the humble trifle into a confection. Here's a classic dessert with no rules, apart from the ones you make yourselves, or are passed down the generations from aunts and grannies. My aunt's famous trifle version was with candied stem ginger and the sponge base soaked in ginger wine. Custard, cream, then finished with crystallised ginger. Nice if you're a ginger fan like me! Gran's version was more traditional with sherry. If you like big desserts to share, these days we've kind of lost that sweet trolley way of serving in restaurants, so you need to make the magic at home instead. 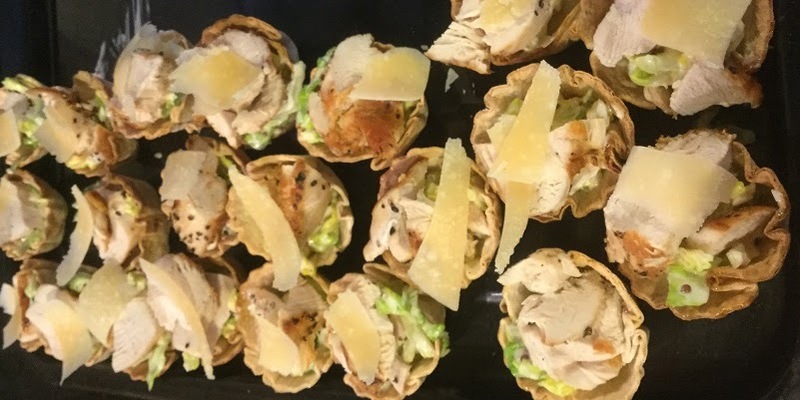 The good thing about catering in people's houses like I did from 2006 - 18 was that we could try things out that you wouldn't normally find in a restaurant. Restaurants have to stay on trend and worry about their reputation with every dish they serve. When you're catering in the house, there's more scope to just make things people like. There's also a scientific reason behind the love for trifle. It is one of those Olde English desserts which you tend to find more in the autumn/ winter. It's as the nights get longer, and the hours of daylight shorter, our serotonin and dopamine levels fall. Trifle is full of dopamine and serotonin triggering ingredients - sugar, eggs (in the sponge and custard) and cream/ milk in the custard and whipped cream topping. Maybe chocolate too if you add that. Your brain remembers how good you felt when you ate it last time and craves it again to boost your mood. Why not make it today? What is the difference between Victoria sponge and Genoise sponge? Victoria sponge base is the most common sponge cake in the UK due to its ease (called pound or butter cake in the US) and it is aerated by whipping butter, sugar and eggs, then folding in flour. Genoise is more of a batter and heated while you beat the eggs over boiling water like sabayon. Beating the eggs over heat traps air in the batter which makes the cake rise as it bakes. This way you can use less fat (butter/ shortening). Start off cooking genoise like hollandaise sauce - the eggs and sugar in a bain marie over boiling water, whipping with an electric whisk. This could take 6 - 7 minutes. The egg and sugar should have trebled in volume and be pale and thick - like sabayon. Take off the heat and fold in the flour, melted butter and vanilla. Transfer into a greased and lined 23cm springform baking tin. Bake at 180 oC for 20 - 25 minutes. You can test the centre with a skewer. Leave to cool on a cooling rack. Place the rhubarb in a deepish baking tin. Pour the sugar and rose syrup over and mix through. Roast for 15 minutes at 180 oC till soft. Allow to cool. Whisk together egg yolks, sugar, vanilla and cornflour. Heat milk and cream in a stainless steel pan* till just under the boil. Pour cream mix into the egg yolk/ sugar and whisk together. Pour back into the pan and put on a medium heat, whisking to avoid sticking to the bottom of the pan/ makng lumps. Whisk these 3 things together till you form soft peaks. In a mixing bowl mix a small bit of rose syrup through the sugar. It should turn pink. Tastes amazing too. Break up the sponge in the bottom of trifle serving dish. 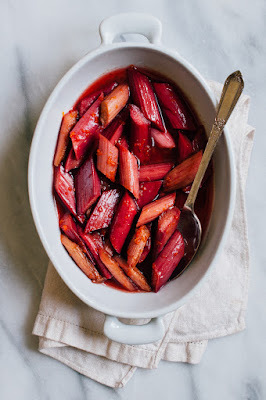 Spoon over the rhubarb and the roasting juice, reserving some rhubarb pieces to garnish the top. Spread the anglaise on top, then pipe the rose chantilly cream on top. Garnish with pieces of rhubarb, the rose sugar and rose petals. 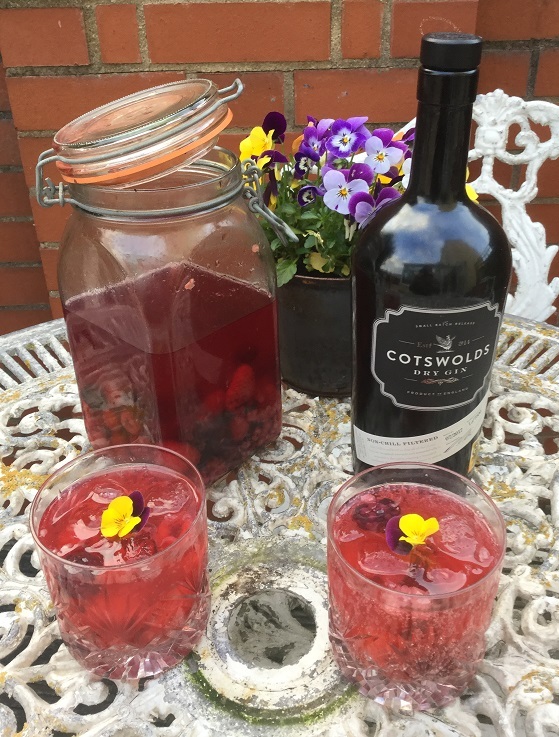 Add some rose syrup to your normal G & T. Beautiful summer drink! 120 individual lemon meringue pies with raspberry mojito sorbet in a gazebo in a field in the middle of nowhere? Why sure, no problem. When you're catering on a larger scale rather than at home, you break down the components of each dish into more easily manageable steps. When you make a single lemon meringue pie at home you probably make your tart case, bake it blind, then remove the baking beans or flour parcel add the filling, bake that, then add the meringue on top and bake that. When you're catering you have to transport everything from your kitchen to a venue which could be up to an hour and a half/ two hours away and involve motorways down to windy single track country lanes before finally going off road, so things have to be done a little bit differently. There's just no way of transporting the delicate meringue topping if you still want everything served to perfection, so you just make it there on the field, and have the lemon tart mix and tart cases ready to go. 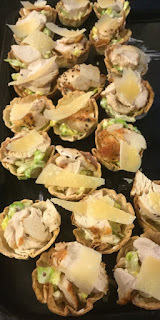 Another difference with catering is you have to think of food safety - you don't want to give 120 people food poisoning from uncooked eggs (meringue doesn't get the eggs to a safe temperature) so we use pasteurised egg whites, which these days you can find in larger supermarkets normally near the ambient pastry and margarine. I tended to make two types of meringue - French and Italian. French - Uncooked, the one you're most familiar with. You whip the egg whites, then slowly add the sugar, then critically, leave it beating for a further 5 minutes. Then you bake it. Italian - You heat sugar and water to 116 oC. Whip the egg whites and once they're up to soft peak, gently add the hot sugar syrup. If the egg whites were at room temperature, the hot syrup cooks the whites. Then carry on whipping to firm peak. This is cooked and stable meringue and can be refrigerated. Anyway, with 120 lemon meringue pies at this wedding, I was making Italian meringue and needed to make it in batches. Time was getting on. I'd made the first batch fine. With these particular lemon meringue pies in the catering gazebo in a field in Wales, I was having egg white nightmares. I'd taken my Kenwood mixing machine to make the meringue (you always have a generator on hand for power), but making meringue from liquid egg whites rather than fresh is slightly different. Maybe the bowl wasn't 100% grease free, maybe the egg whites were too cold (they mix best from room temperature). But the second batch of meringue would not whip properly - kept collapsing. No stability. Ahhhhh! The guests were almost sitting for their starter. I'd wanted to get all the lemon meringue pies made before the starter, because once that main course goes, it's a race to get the kitchen cleared and the dessert plates up and ready. But there was just no way that was going to happen. 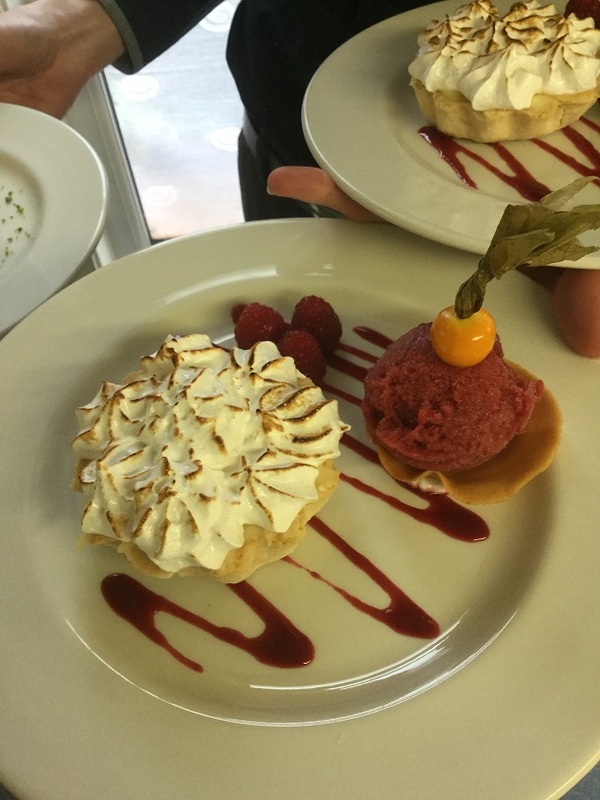 As soon as the starter had been sent out I was whipping up the second batch of meringue and had them piped just in time to get the main course in to the oven and get it out on to plates. Then the minute we'd plated the last one I was back on the third batch of meringue. Recipe Book (now not so new). This is the shortcrust pastry recipe that changed my pastry making - it just works so well and consistently. Mix together everything but the water with your fingers till it resembles fine breadcrumbs. Add water and mix together to make a dough. Lightly flour the work surface and knead the dough briefly till it get a smooth even consistency. Wrap in clingfilm and refrigerate for 20 mins. When you roll out your pastry roll it out slightly larger than your pastry case as shown here. Blind bake the cases with the flour parcels as shown on that link, or baking beans for c. 20 mins till golden. Then remove flour parcels and brush the bases and side with beaten egg sealing up any holes as shown here. This also strengthens the sides of the tart case and replace back in the oven at 180 oC for 6 minutes. 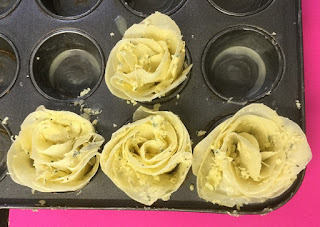 Now holding in an oven cloth, you can trim the edges of the pastry so the pastry is flush to the top of the tart case, and remove it to a cooling rack. You can make the bases up to a week in advance and keep on a tray covered with clingfilm or an airtight container (but be careful not to move them too much as they can be fragile). 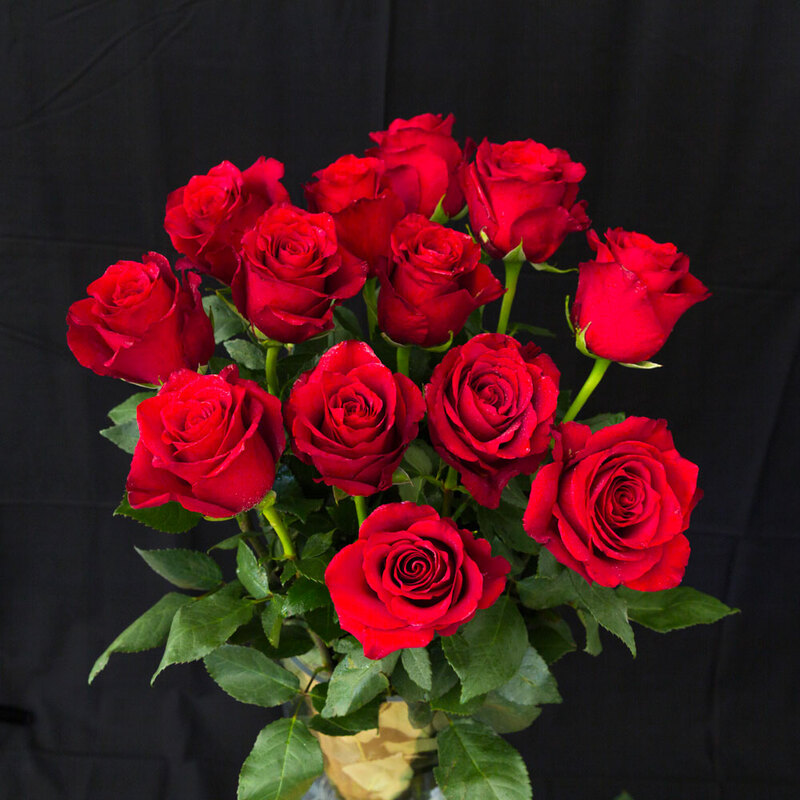 Place them somewhere they are not going to get damaged with them either falling off a shelf, or something heavier falling on top of them and crushing them into a million pieces. I found the front of the van was a great place for storage of the pastry cases - the one safe place. Mix it up all in one mixing bowl - that's the easy part. You can pour the filling mixture into oven proof casserole dish and bake in a bain marie like a creme brulee till set (c. 30 - 40 mins). The second option is ideal for making in advance - a day or two before and keep it cool in the fridge. To cook, put the mix into a deep tray, then put that into another larger deep tray and top up the second tray with water so it comes 1/2 way up the lemon tart mix tray. This ensures even cooking and stops it burning around the edges of the tray. Cover the top of the tray with tin foil. Bake in the oven for 45 - 60 minutes at 160 oC till set. Take out the oven carefully to avoid spilling, or getting water in the lemon tart mix. Leave to cool before covering and refrigerating till use. Another recipe seared onto the memory - it came back while driving to work. It was an American recipe, so in cup measurements (1 cup being 250ml). If you're using pasteurised egg white, most cartons have measurements for the number of egg whites on the side, otherwise it's useful to know that one egg white is 30g. If your egg white is coming straight out of the fridge I found you can blast it in the microwave on defrost for 30 seconds. Might need another 30 seconds. Test with a temperature probe. You want it to be around 20 oC before you start whipping for optimum meringue. Also if it's too cold all the heat goes out of the sugar and it doesn't cook the whites, so then the meringue collapses after a while. Tried and tested that one. Heat the caster sugar and water in a pan. Brush down the sides occasionally with water to stop it crystallising. Heat to 116 oC which you can test with a thermometer. Meanwhile, whip the egg whites in your electric mixer with the whisk blade till you reach soft peak stage. Keep the egg whites whisking. Once the sugar syrup reaches 116 oC pour very slowly into the whites as the machine is still whisking. Add the cream of tartar. Keep beating for 5 minutes till thick and glossy. Now it's ready to use, or refrigerate. When it's time to serve your lemon tart / meringue pie spoon the cooked lemon tart mixture into the tart cases and level off with a palette knife. If you are making lemon meringue pie you pipe the meringue on top now and glaze it quickly with a blow torch. If you are using the Italian meringue recipe above the meringue is cooked already so you're good to go. If you are making lemon tart, sprinkle with demerara sugar and glaze the top with a blow torch so you have a crème brûlée like crunchy topping. This will last about 1 hour. Do not try and put in the fridge once glazed as the moisture in the fridge softens the glaze to a syrup and the tarts go soft, and your wonderful dessert is no longer so wonderful. 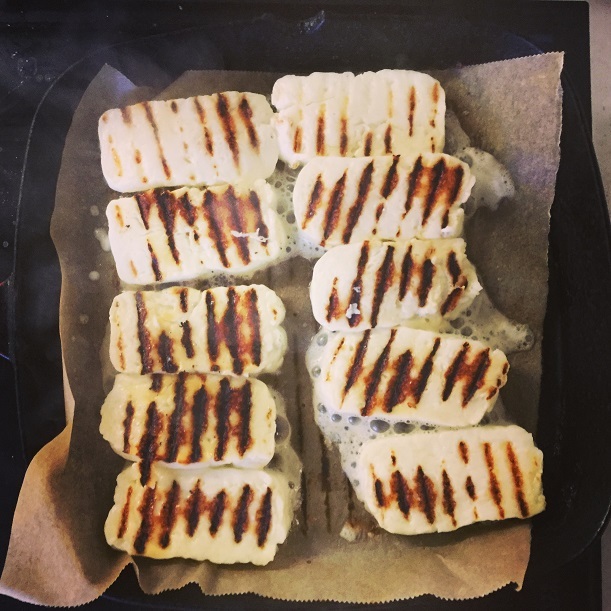 The flavour in grilled halloumi comes from those bar marks. Kind of annoying when the halloumi sticks to the grill pan and the bar mark layer is left on the pan though, isn't it? I've tried flouring it, which can also be done with gluten free flour. But after a few rounds your grill pan is clogged up with excess flour, and you might not want an extra flour coating anyway. Why does halloumi stick to the grill pan? A piece of greaseproof paper directly on to the grill pan. You don't even need to oil it. If the greaseproof paper burns too much after a few rounds of halloumi you can just replace it for a new sheet. How stress free this makes your life. Mix all these ingredients together in a mix bowl. Whisk to combine. Cut halloumi into slices. Place in a new food safe plastic bag - the marinade gets more contact using a bag. Place haloumi in the bag and the marinade over both sides. Tie it closed carefully - don't want it to leak or damage the slices of halloumi. Place on a tray in the fridge for as long as you can so the halloumi soaks up maximum flavour. It will keep for 3 days. Cut the halloumi in to chip shapes. Mix some dried mixed herbs and cajun spice into plain flour. Dredge the halloumi in the spiced flour and shake off any excess. Fry at 180 oC for a minute or two till crispy. Papas Arrugadas or Canary Potatoes as we also know them. Cooked in so much salt they have a salty crust on them. Originally they would have used sea water, but these days you use tap water with tons of salt. The pic here on my ipod doesn't quite do them justice - they were really crusted all over with salt. My grandparents found Tenerife back in the early 80's. Back then you played cards in the library, dressed up for dinner and repaired to the drawing for brandy or liqueurs. Going back twice a year (November and the whole of February) they met up with a social scene of fellow English holidaymakers of the same age who kept going back to - a home from home. Every night it would be a different restaurant - there were lots to choose from, many of which now have sadly closed as the younger generations tastes have moved on, and the owners of the restaurants have retired. Most of the restaurateurs knew their regular customers, even though they came out only twice a year - that's how to keep people coming back! One of the must have accompaniments for every main course was the papas arrugadas served with mojo sauce which comes as either green or red, based on green or red chilli peppers. We've always tried to reprocate the sauce, but never quite got it as nice. A work in progress. Green seems to go better with fish, red with meat. Up to last year I had also never quite ventured into trying those potatoes, but they were the ideal accompaniment for whatever Spanish theme menu I was doing that night. The Spanish word for potatoes is Patatas as you know from patatas bravas. Papas is the word they use in Latin America. It was the Incas who brought potatoes over from Latin America in the 1500's, at first as a plant, nobody really wanted to eat them. In truth we don't have quite the right potatoes in this country. In Tenerife it's Papa Negra. The nearest I could find was Jersey Royals because of the hard earthy skin. This is more salt than you can think is humanly possible, but hang in there- they're going to be amazing potatoes! 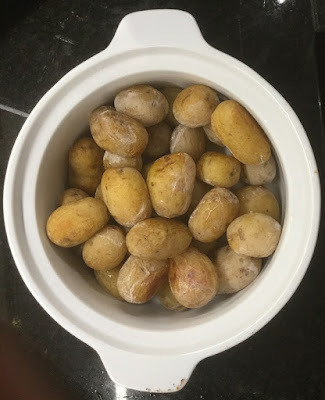 Put the Potatoes in a large saucepan and cover with water. Add the salt. Bring to the boil and boil for about 20 minutes till soft. Drain the water and put the potatoes back in the pan on a low heat to boil dry. This is what makes the dry salt crust on the outside. If you're cooking these in advance I found you could reheat them in the oven on a tray with foil over for about 15 minutes @ 180 oC. Beware making something nice for a wedding tasting - you might have to reprocate it on the wedding day itself! And so it proved with these potato roses. Your wedding is your special day. There's no second take, so you have to try everything possible to make it the best you can. 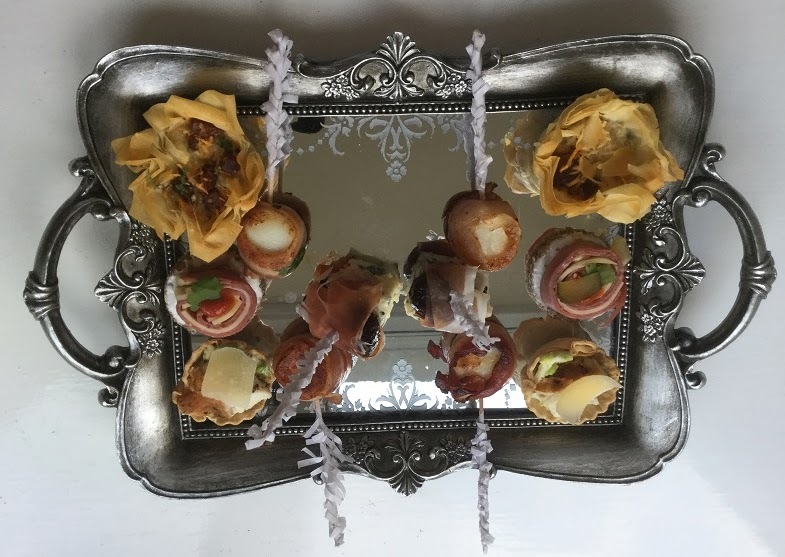 I certainly tried to push out all the stops for the weddings we catered for and often made things nobody else would do because they're just too time consuming and which increase the pressure in the kitchen on the day. But I always loved the challenge. 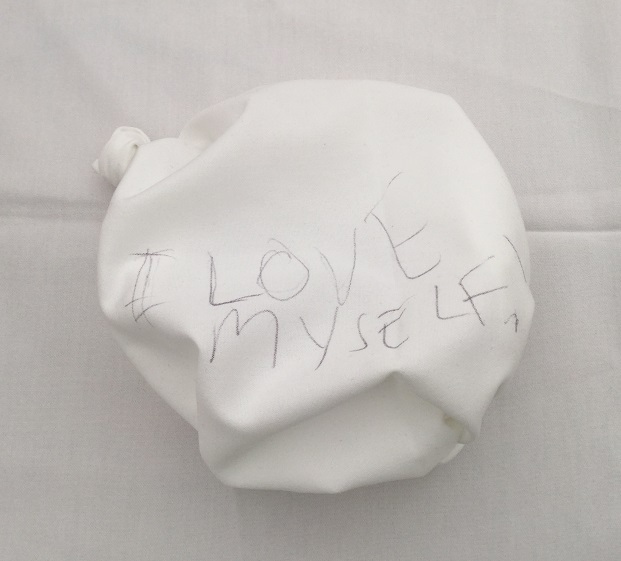 We were making these late in to the night prior to the wedding day, kind of wishing I'd never had the idea. Then they chill overnight and you can reheat them through the oven just before serving. 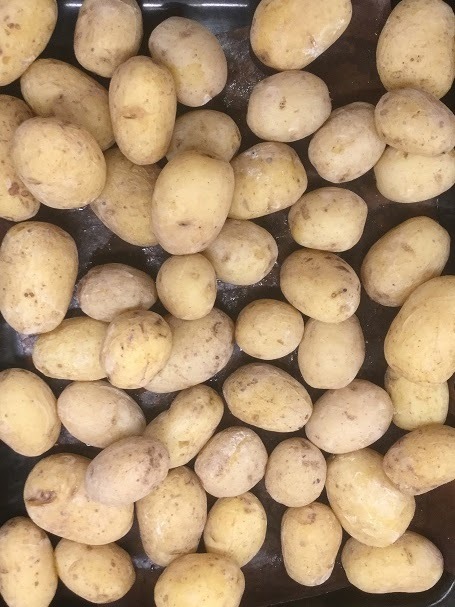 You need to start with Maris Piper potatoes - they are fail safe crispy on the outside and soft in the middle. There's a great video here which shows how they're done. 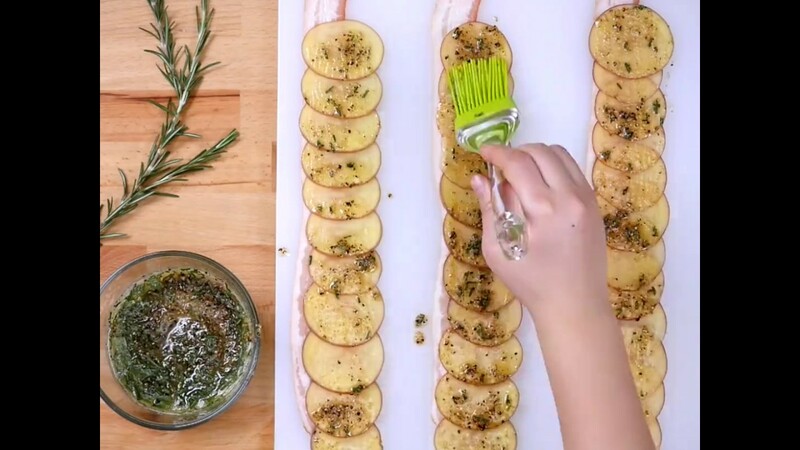 That recipe uses bacon as well - what a great idea! Salt and freshly ground pepper. You could try using smoked salt. It's a good idea to make sure the potatoes are at room temperature. 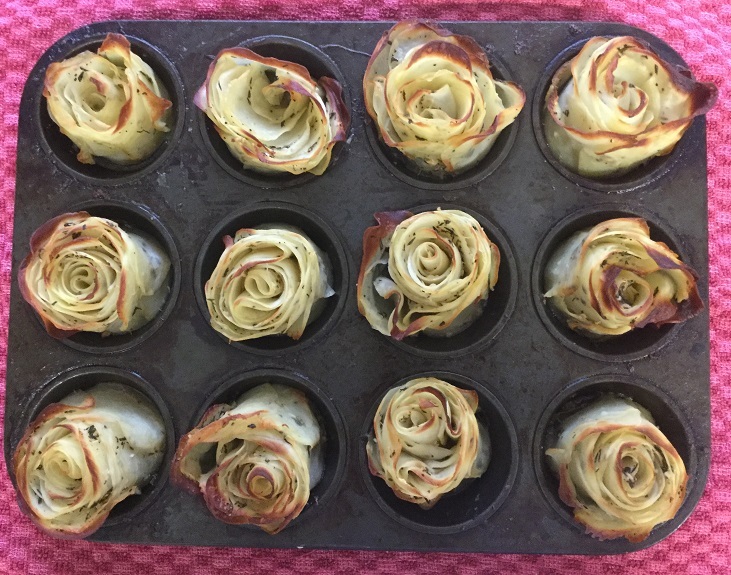 I kept mine in the fridge to keep them fresh, or outside in the winter, so when I was making these potato roses I left the potatoes out in the kitchen to come up to temperature. If the potatoes are too cold when you mix the melted butter through, the butter solidifies before you have time to lay them out. However, if the butter does set you can nuke them in the microwave for a minute or so just to melt the butter again and you're good to go. Before starting, lightly butter a muffin tin. Slice the potatoes thinly on the mandolin. Discard the end pieces (you can bake these separately as crisp snacks with some olive oil & salt). You just want nice big potato slices. Place the potatoes in a mixing bowl with the melted butter, garlic and thyme. Season with salt and pepper. Mix together very well, trying to separate out each slice of potato. Lay out the potato slices on your kitchen work surface as above. Start with one slice, then overlap with another and so on in a line. I found 16 - 20 slices made a decent portion. 1 line makes one portion. When you have laid them all out, roll them tight like a cigar from the bottom to the top. Then place in the muffin tin as seen above and unfurl slightly into a rose shape. They spread out more as they cook - as you see below. To bake I found the best way was at 160 oC for about 45 minutes, then turn the oven temperature up to 180 oC for further 10 - 15 minutes to crisp them up. Test them with a knife - the centre should be soft like chips. If they are not cooked in the middle but golden on the edges cover in tin foil to stop them browning and allow them to carry on cooking. Lift out of the muffin case with a mini palette knife. 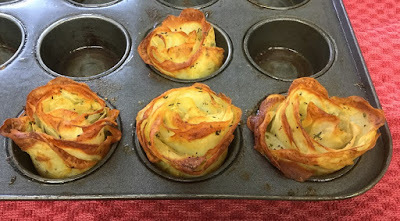 If you are cooking these in advance, halt them at the 45 minute point where they are still just soft in the middle, but not fully crisped up, like the ones at the top of this page. At this point you can cool them, cover them and refrigerate them till you want to use. They should last 3 days in the fridge. Then, when you want to finish them off, place in a preheated oven at 180 oC for 10 - 15 minutes till hot, crisp and golden. Ask a chef their favourite food they like to eat in their downtime and it's likely to be something 1. easy to heat and 2. easy to eat. Beans on toast, noodles or fish finger sandwiches. That's if they actually get downtime. It's like we regress to childhood when it comes to comfort food. 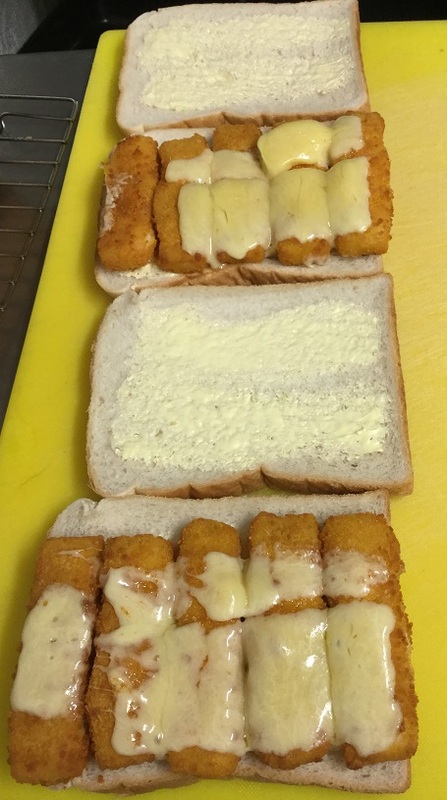 Chef Ross likes to take fish finger sandwiches to the next level and puts sliced cheddar on top and puts them under the grill to melt the cheese. He put them on the menu at the pub he had and they flew out of the door at lunchtimes. What's not to love? This particular sandwich refuelled us on Christmas Eve 2017 before the Christmas Day rush. Don't use fancy bread here - it just wouldn't be right, we're trying to summon greasy spoon caf here. Dirty sandwiches. Grill the fish fingers. When hot arrange cheese on top and put back under the grill to melt. Butter bread. Slide cheesy fish fingers on top. Spread to ketchup or tartare sauce if you like. Eat like you haven't eaten all day. If you're working in a kitchen it's quite possible you haven't. Pomegranates are a fruit, so you can drink pomegranate rum and lemonade safe in the knowledge you're getting 1 of your 5 a day! I became obsessed with pomegranate seeds after falling in love with the Ottolenghi Jerusalem book. On salads, on slow cooked shoulder of lamb, mixed through cous cous, in kachumber, made into a salsa, scattered over starters. 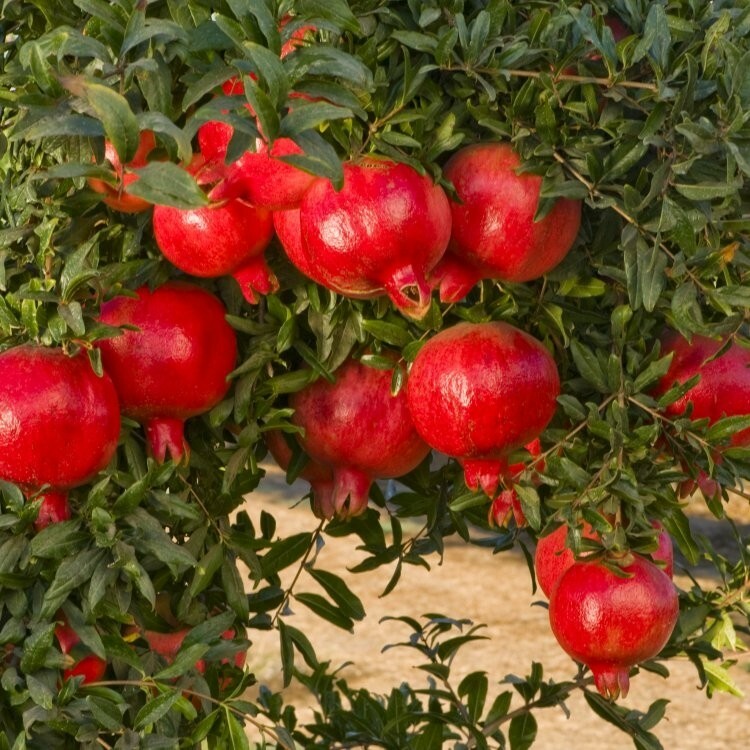 What's not to love about pomegranates? They're full of vitamin A, C and E, Iron and anti oxidants. They're healthy living, taste great, make a great garnish and they're also helping Afghan farmers to switch from growing opium poppies as the demand for pomegranates is getting a great price for farmers. 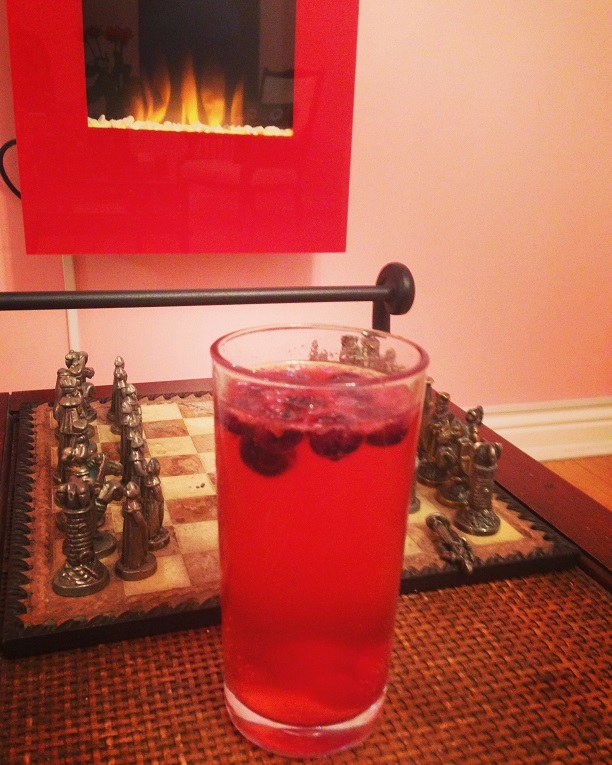 This pomegranate rum came about on a Monday - after clearing up weekend returns from dinner parties. 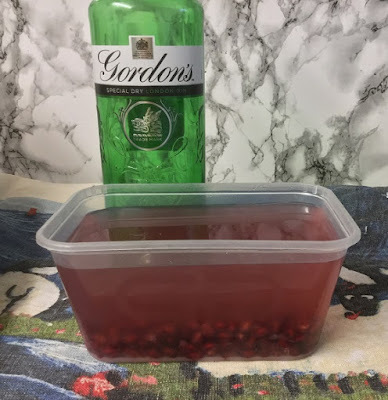 What to do with the leftover pomegranate seeds? That is before I could found out you can freeze pomegranate seeds. After my raspberry whisky, blackberry vodka and blueberry gin this seemed like a good combination. There was always rum lying around in the store from making raspberry mojito sorbet. This mixes very well with lemonade as a long drink with a little ice - refreshing on a summer's night. Crunch the seeds as you drink. Put these 3 things in a large enough jar or plastic container. Seal the top well, then shake to combine the sugar. Place in the fridge and shake again every day. After 7 days it should be ready. You need to keep this in the fridge as the pomegranate seeds will start to ferment otherwise (as I once found out). Will last in the fridge for months, theoretically, but it's so nice there's not much chance of that. Careful how much you drink! 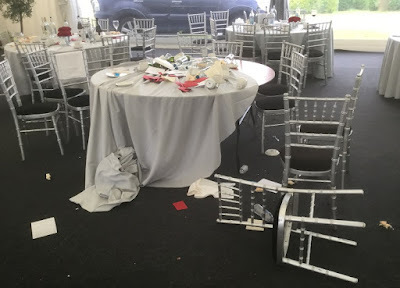 This is the morning after the night before at a charity ball - looks like someone took the tablecloth with them! Another guest at the same event as above had clearly had a few and modified a napkin into a hat. 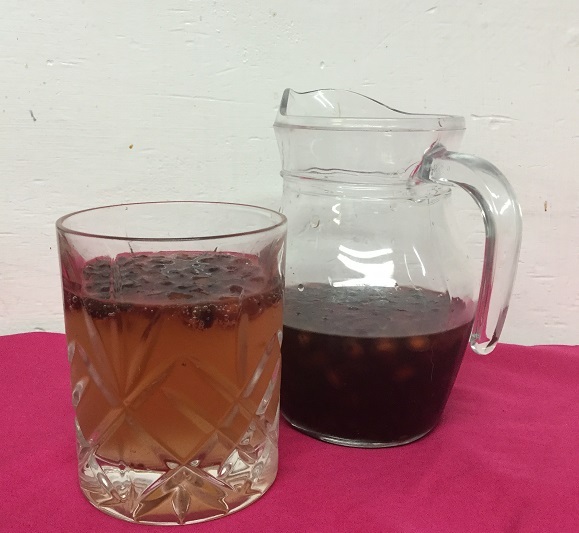 For a non alcoholic version you can make a pomegranate cordial by dropping the pomegranate seeds in hot sugar syrup. After trying the soft Korean drinks which have bits of rice or jelly in, I'm a fan of drinks with bits. That's what I was going for with the pomegranate cordial below - you crunch the seeds as you drink. You probably want ice in there too (didn't have any that day - the freezer was full of food instead). Pummel your pomegranates and cut them in half. Bash the base with a large metal cooking spoon and the seeds drop out. Wear an apron, unless you want to wear some pomegranate juice. Remove pith from the seeds. Place the sugar and water in a pan with the pomegranate seeds. Heat gently till the sugar dissolves. Keep on a low simmer for 10 minutes. 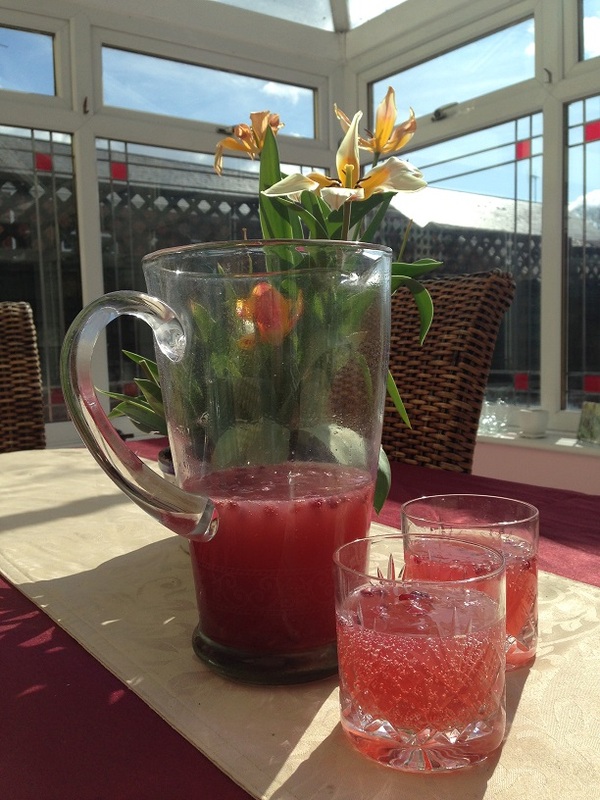 The water should reduce slightly and some of the pomegranate seeds should burst to release their juice. You need to keep this in the fridge as the pomegranate seeds will start to ferment otherwise (as I once found out). Will last in the fridge for 2 weeks, theoretically, but it's so nice there's not much chance of that.